What would it look like to approach Saturn in a spaceship? One doesn’t have to just imagine — the Cassini spacecraft did just this in 2004, recording thousands of images along the way, and thousands more since entering orbit. Recently, some of these images have been digitally tweaked, cropped, and compiled into the above inspiring video which is part of a larger developing IMAX movie project named Outside In. In the last sequence, Saturn looms increasingly large on approach as cloudy Titan swoops below. With Saturn whirling around in the background, Cassini is next depicted flying over Mimas, with large Herschel Crater clearly visible. Saturn’s majestic rings then take over the show as Cassini crosses Saturn’s thin ring plane. Dark shadows of the ring appear on Saturn itself. Finally, the enigmatic ice-geyser moon Enceladus appears in the distance and then is approached just as the video clip ends. Late last year, a new, remarkably bright storm erupted in Saturn’s northern hemisphere. Nicknamed “the Serpent Storm”, the northern hemisphere disturbance is still going strong and now circles far around the planet. Offering spectacular space-based views to the Saturn-orbiting Cassini spacecraft, the storm shows enough contrast with the banded cloud tops to be visible with even modest ground-based equipment, as seen in this sharp image from Buena Vista, Georgia, USA, planet Earth. 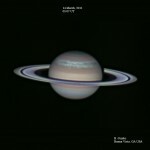 Amateur astronomers first spotted the bright storm in early December 2010, with the ringed gas giant rising in predawn skies, and continue to monitor the storm’s progress.